There is a slow dreamy feel to this book, a slow wandering through a mystery. This book reminds me of those poems where the shape and rhythm match the subject of the poem. Don’t expect this to be a fast, action-filled read. While there is plenty of action, the action is a slow wending through the story, interrupted here and there by musings and comical mistiming. The whole story envelopes you in the heroine’s dreamlike state as she works her way to awakening. There are multiple well-fleshed characters in this book, but take a moment to make note of their names if you’re not used to Korean/Asian names. I find this type of names forgettable and confusing for some reason unless I take a mindful notice of the differences. With the names firmly seated, you’ll find the intertwining stories and dreams much easier to decipher. This is a very pleasing, original, and enjoyable book that reminds me somewhat of Kate Elliot’s Court of Fives books on the one shore and Korean mythology/fantasy on the other. I think if you enjoy Kate Elliot’s Court of Fire and Cold Magic/Spirit Walker books or fantasy set in near-real cultures, that you’ll enjoy this book. 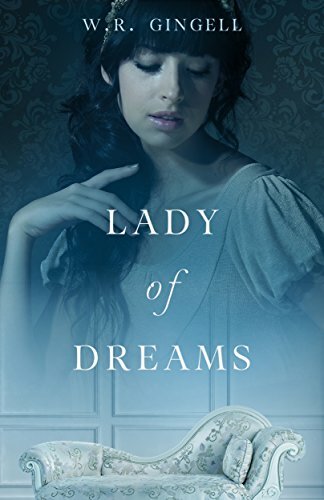 One warning: If you expect one of Gingell’s fast-paced short fairy-tale type books as she’s written so many of, you will be reading this story with the wrong mindset. This is perhaps Gingell’s strongest book to date, but it proceeds at a dream-like pace and the longer length is needed to fully flesh out the mystery, world, characters, and story. You’ll find yourself immersed in a detailed, believable world and invested in the story’s outcome. I’m very pleased that this novel qualified for Kindle Scout. To dream from a distance, or wake and risk losing it all? When a moment of unthinking sympathy twines Clovis’ dreams with the bored, playful composer Yong-hwa, she must decide whether to keep dreaming in the comfort of her chaise lounge, or to awaken into a reality that is by no means so sure or familiar as her dreams.